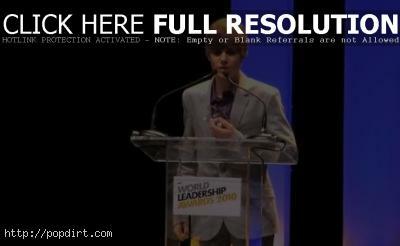 At the World Leadership Awards 2010, Justin Bieber and Pencils for Promise founder Adam Braun joined together on stage to talk about the charity that partners with local communities to build schools and increase educational opportunities in the developing world. “First of all I just want to say thank you. I’m young and I like to help other young people and this is amazing,” Bieber told the audience before bringing Braun up to speak. very proud to be helping others with @pencilsofpromis ….Young People can make a difference! Watch the remarks via Vimeo below.